Traditional PSL - Watch Erin Brockovich in class. Complete viewing guide and turn in by the end of the day on Wednesday. Review photo submission guidelines (due Wednesday, 4/24). Honors PSL - Watch Erin Brockovich in class. Read Badlands for homework, and complete Flipgrid assignment by noon on Thursday. Review photo submission guidelines (due Wednesday, 4/24). FlipGrid Tips for Honors PSL - Use THIS link to access our class page, and log in with your perry-stu.com account. Your video has a two minute time limit, so plan your responses to that they are thoughtful and complete, but also succinct. Friday, April 19th and Monday, April 22nd - No school due to the Easter holiday. Wednesday, April 24th - Please note we are on an adjusted schedule today due end of course testing. Click HERE for specific class times. Photo submissions are due today. Continue discussing environmental benefits and burdens with Mr. Tom deHaas, the Lake County Agriculture/Natural Resource Educator for OSU's Extension Office. Friday, April 26th - Participate in Environmental Justice field experience at Champion Farm in Perry. Please report to the PSL room at the start of the block for attendance, and wear clothes/shoes you can work outdoors in. Monday, April 8th - Begin unit on Environmental Justice with a look at Cleveland's role in shaping the environmental movement. 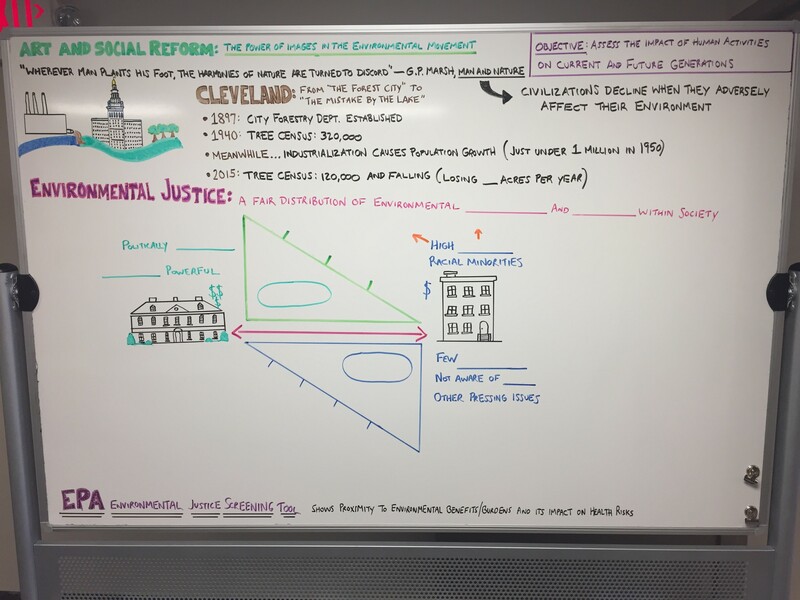 Complete notes on "The Power of Images in the Environmental Movement" and graphic organizer on "Environmental Justice." Use EPAs EJSCREEN mapping tool to identify environmental benefits and burdens in Lake County in your notebook. Exit slip: Show your notebook to Mr. Soeder or Mrs. Trentanelli so that they can review your responses to the questions you answered using the EPA's Environmental Justice Screening Tool. Wednesday, April 10th - Study techniques to improve photos including simplicity, shooting from low angles, showing depth, subjects diagonally, shooting from the level of the subject, shadows, silhouettes, reflections, symmetry, and editing. Analyze PSL environmental justice photo contest winners from the last five years and identify which techniques the photographers employed. Complete photo proposal form. Friday, April 12th - Turn in time sheets at the start of class today. Complete survey for PSL alumnus. Review photography techniques with PSL exemplars. Discuss art as activism during Progressive Era, Great Depression, and environmental movement. Analyze photographs from EPA's DOCUMERICA project. Homework: Upload photograph using this form by April 24th. 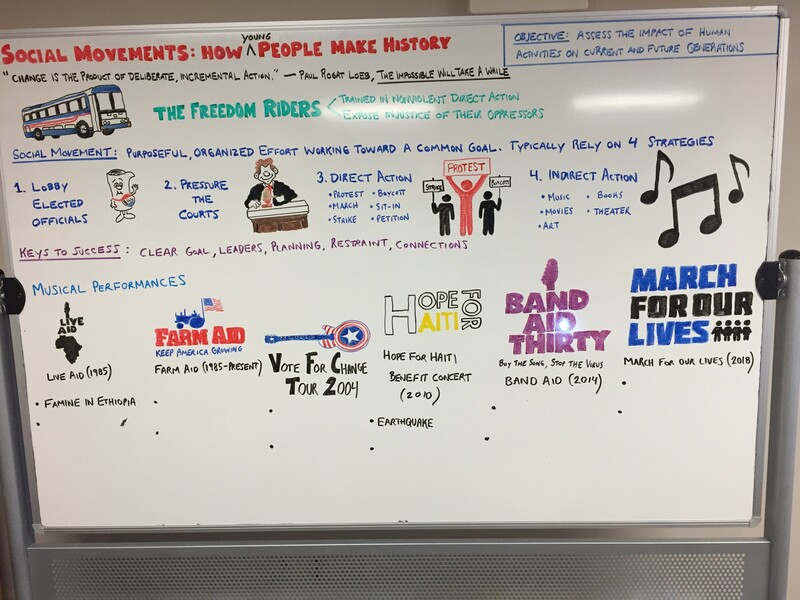 Monday, April 1 - Introduce Art and Social Change unit with the story of the Freedom Riders and take notes on social movements. Select one historical musical performance and complete guide assessing its short and long term impact. Wednesday, April 3 – Pass out "Your Life, Your Choice" field trip permission slips. Review impact of historical musical performances. Introduce song for social change assignment. Homework: Select a song for social change of your choice and make a 10-12 minute presentation you can share in small groups on Friday. Friday, April 5 – ​Submit time sheets at the start of class today. Turn in "Your Life, Your Choice" field trip permission slip (due by Wednesday 4/10). Share protest songs in small groups, completing group analysis and self assessment. The Perry Public Library is seeking volunteers on March 27th and 28th. If you would like to help, please call 259-3300 and ask for Linda Moats. If Linda is not available, please leave your name and phone number. This counts toward your 10 extra hours. Monday, March 18th - Begin unit Becoming an Activist by listening to guest speakers share their experiences with addiction, and reading/annotating "Watching Friends Recover From Addiction on Facebook." Homework: Write a precis on the article, and share with Mrs. Trentanelli prior to class on Wednesday. Wednesday, March 20th - Review Monday's discussion, and begin watching the PBS Frontline documentary Chasing Heroin. Friday, March 22nd - Submit time sheets at the start of class. Finish watching Chasing Heroin, and submit movie guide. Be sure to note which activity you will participate in as your summative assessment for this unit. Monday, March 11th - Finish presentations on immigration reform topics. Students who were absent during any presentation are encouraged to get notes from a classmate. Quiz on immigration reform topics. Wednesday, March 13th - Draft a letter to an elected official regarding a pending piece of immigration reform legislation and share it with Mr. Soeder at soederm@perry-lake.org by the end of class today. Friday, March 15th - Submit time sheet in x2vol at the start of class. Complete notebook check and third quarter reflection question. Traditional PSL: Complete self-evaluation of letter to elected official. Peer edit. Make needed revisions. Use the following links Representative Joyce, Senator Brown, Senator Portman, or President Trump to submit your letter. Make sure a teacher witnesses your submission and share your final copy with Mr. Soeder in order to earn full credit. Honors PSL: Final copy of profile feature article due by the end of class today. Bonus opportunity for honors students who have completed their profile feature article: view Lifeboat and share 3 takeaways with soederm@perry-lake.org by the end of class today. Monday, March 4th – Guest speaker: Valentina Seeley, Community Relations Officer with Immigration, Customs, and Enforcement (ICE) delivers "ICE 101" presentation and takes questions. Use remaining class time to complete presentation due Wednesday. Honors PSL: Review profile feature writing guidelines. Outcasts United essay due at the end of class on Wednesday. Wednesday, March 6th - Participate in presentations on immigration reform topics. Honors PSL: Outcasts United essay due at the end of class today. Submit rough draft of lede for profile feature by the end of class on Friday. Friday, March 8th - Turn in time sheets at the start of class. Continue presentations on immigration reform topics. Honors PSL: Submit rough draft of lede for profile feature by the end of class today. Rough draft for entire profile feature due at the end of class on Monday. 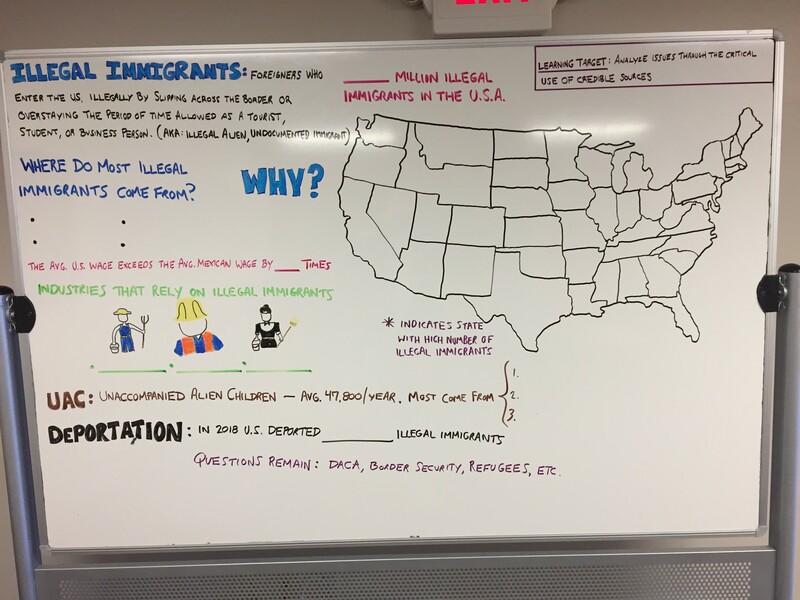 Traditional PSL: Take notes on facts/stats regarding illegal immigration. Introduce articles for next week's precis/presentation. Review Chapter One of Enrique's Journey, and complete quiz. ​ Homework: Read pages 190-196 of Enrique's Journey and prepare for assessment on Friday. Prepare for presentations that will be shared with Mr. Soeder and Mrs. Trentanelli on Friday. Honors PSL: Precis #1 due today. Quiz and discussion on Outcasts United. Homework: Follow up to interview request you sent on Friday. Read and take notes on chapters 22-26 of Outcasts United by Wednesday. Complete second precis by Wednesday. Wednesday, February 27th - Watch Farmingville and complete viewing guide. Homework: Read pages 190-196 of Enrique's Journey and prepare for summative assessment (evaluating Nazario's statement that immigration, "is a powerful stream, one that can only be addressed at its source" in light of the text, as well as other classroom resources). Precis is due at the end of class on Friday. Prepare for presentations that will begin on Wednesday. Honors PSL: Precis #2 due today. Quiz and discussion on Outcasts United. Prepare interview questions. Read and take notes on Ch. 27-Epilogue of Outcasts United by Friday. Make arrangements to conduct interview on Friday. Friday, March 1st – Turn in time sheets. Take summative assessment on Enrique's Journey​. Precis due by the end of the block today. Homework: Prepare for presentation on Wednesday. Honors PSL: Conduct interview with local leader on immigration issues affecting Northeast Ohio. Discuss Outcasts United. Monday, February 18th – No school due to Presidents Day. Wednesday, February 20th - IGA SHOPPING SPREE FUNDRAISER TICKETS DUE TODAY! Traditional PSL: Participate in reading quiz on The Prologue from Enrique's Journey. Homework: Evaluate organizations that are addressing immigration/poverty and share with the class. ​Read/take notes on Chapter 1 of Enrique's Journey prior to class on Monday. Honors Seminar: Quiz over chapters 5-9 of Outcasts United. Discuss chapters 5-9 of Outcasts United. Determine who you will be interviewing. Homework: Read/take notes on chapters 10-14. Locate at least two sources relevant to the person you will be interviewing or the organization they represent. Share these sources with soederm@perry-lake.org by Friday. Mr. Soeder will ask you to precis both sources OR suggest alternative sources to precis if the articles lack credibility or relevance. ​Thursday, February 21st - Please note that PHS is on an adjusted bell schedule due to ACT testing. Traditional PSL: Turn in time sheets. Participate in OPTIC analysis (both in notebook and via group assessment). Homework: If you missed the quiz on Wednesday, or are unhappy with your score, you should complete this alternate quiz by Friday, March 1st. Read/take notes on Chapter 1 of Enrique's Journey prior to class on Monday. Honors Seminar: Turn in time sheets. Make sure your precis article links are on the google sheet. Outcasts United quiz over Ch. 10-14. Send email interview request. Review precis assignment and complete first precis by Monday. Read chapters 15-21 of Outcasts United by Monday. For additional guidelines, please visit this link. Monday, February 11th – Submit time sheet for week ending February 8th. Quiz over Power of Relationships unit. Begin watching Tuesdays with Morrie. Homework: IGA raffle tickets due on Wednesday, February 20th. Honors Seminar: Submit time sheet for week ending February 8th. Quiz over Power of Relationships unit. Distribute Outcasts United and review online digital textbook assignment. Homework: Read and take notes on chapters 1-4 of Outcasts United by Friday. Wednesday, February 13th – Present checks to Magnified Giving grant recipients. Finish viewing Tuesdays with Morrie. Homework: IGA raffle tickets due on Wednesday, February 20th. Honors PSL should read chapters 1-4 of Outcasts United by Friday. Friday, February 15th – Turn in time sheets. Introduction to immigration unit. Sign up for immigration plunge. 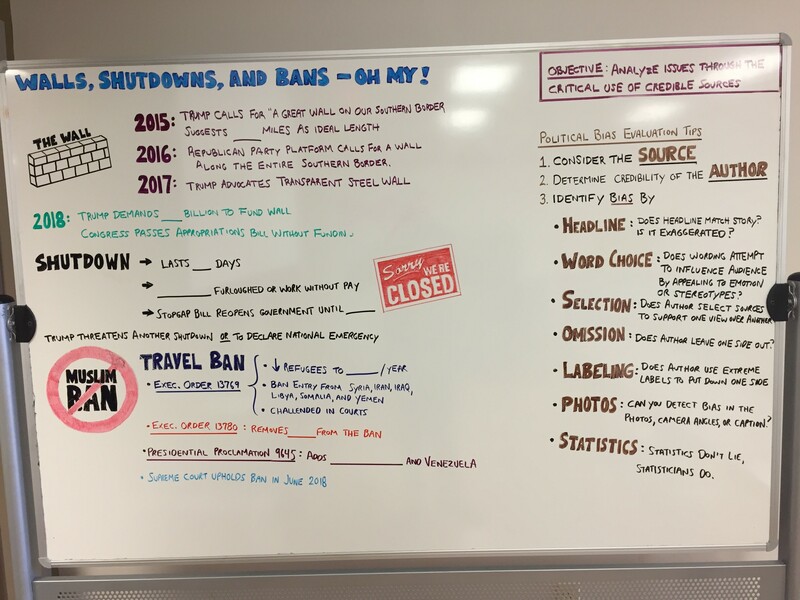 Take notes on Walls, Shutdowns, and Bans. Consider the credibility of multiple sources on the border wall issue. Introduce Enrique's Journey. Homework: Read The Prologue of Enrique's Journey and take reading notes in the appropriate section of your notebook in preparation for Monday's quiz. Honors Seminar - Quiz on reading. Discuss chapters 1-4 of Outcasts United. Develop a list of at least 3 potential interview subjects and bring the list to class on Wednesday. Homework: Read/take notes on chapters 5-9 of Outcasts United by Wednesday. Monday, February 4th - Introduce the Final Exam Service Requirement and sign up for a project today. Introduce writing assessment, and begin developing in class today. Exit Slip: Share introductory paragraph and thesis statement with Mrs. Trentanelli (trentanellia@perry-lake.org) by the end of class today. Wednesday, February 6th - Review extra service opportunities. Finish writing assessment in class today. If you were absent on Monday, please sign up for your required final exam service project today! Friday, February 8th - No school due to Staff Professional Development Day. Monday, January 28th - Submit last week's time sheets at the start of class today. Share exemplar memory books. Using notes from last week's field experience, create a memory book for the person you interviewed. Share completed memory books with Mr. Soeder and Mrs. Trentanelli by the end of class today so that they can be printed and laminated prior to Friday's visit. Note: In the event of a snow day, it is your responsibility to contact your volunteer supervisor and PSL teachers and let them know if you will not be volunteering. Failure to do so will result in your volunteer absence being unexcused. Wednesday, January 30th - Review completed memory books and revise as needed. Friday, February 1st - Share memory book with the person you interviewed. Block 1: Please meet at the Madison Senior Center by 8:00 am. Block 2: Please meet at the Madison Senior Center by 9:40 am. Block 4: Please meet at The Lantern of Madison by 1:40 pm. Monday, January 21st - No school due to Dr. Martin Luther King, Jr. Day. Traditional PSL: Please finish reading Tuesdays With Morrie prior to class on Wednesday. Honors PSL: Please share your in-progress Annotated Bibliography with Mrs. Trentanelli by midnight. Wednesday, January 23rd - Submit time sheets at the start of class. Prepare for Friday's inter-generational interviews by learning how to be an empathetic interviewer, developing thoughtful interview questions, and perfecting interview techniques. Before you leave, show your 18 questions to either Mr. Soeder or Mrs. Trentanelli. Traditional PSL Homework: Complete take-home quiz on Tuesdays With Morrie. Honors PSL Homework: Finalize your Annotated Bibliography, which is due Friday at 3pm. Friday, January 25th - Develop Memory Books with participants at the Madison Senior Center and The Lantern of Madison. Monday, January 14th - Submit time sheets at the start of class today. Traditional PSL: Take reading check quiz on Tuesdays With Morrie, and continue reading the text through page 129 prior to the start of class on Wednesday. Watch excerpts from Morrie Schwartz's interview on Nightline. Honors PSL: Introduce the Annotated Bibliography assignment, and begin conducting research in class. By the start of class on Wednesday, students should have accessed/read at least 3 resources to include in the Annotated Bibliography. 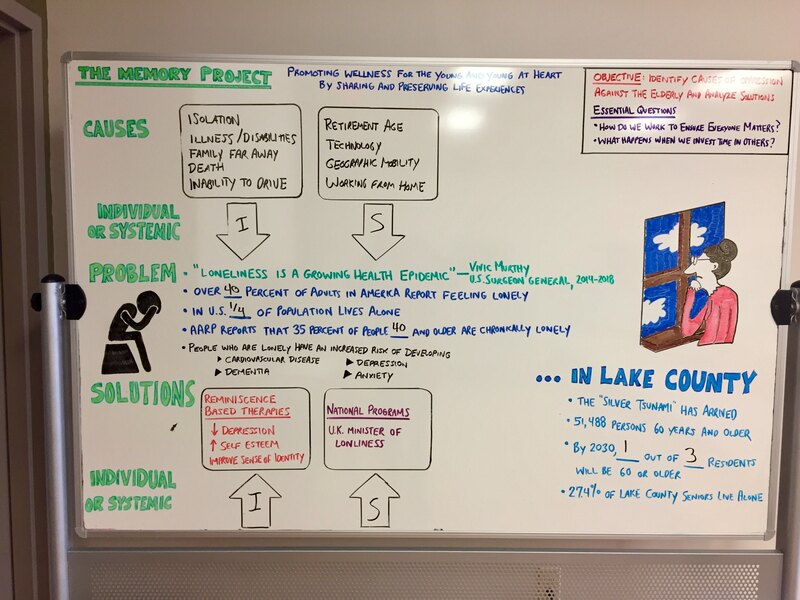 Wednesday, January 16th - Take notes on "The Memory Project" in preparation for Friday's field experience. Traditional PSL: Take quiz on and review pages 69-129 of Tuesdays with Morrie. Use remaining class time to read pages 130-199 by Friday. Honors PSL: Continue working on the Annotated Bibliography assignment. By Monday, students should have cited/annotated at least three resources and shared them with Mrs. Trentanelli. Block 1 students: Meet at The Madison Senior Center by 1:00 pm. Block 1 students: Meet in the PSL classroom to review yesterday's field experience. Block 2 students: Meet at The Madison Senior Center by 9:40am. Block 4 students: Meet at The Lantern of Madison by 1:40pm. Tuesday, January 8th - Welcome back! PSL students should report to their volunteer sites today. If you are unable to volunteer, or if you need a new service placement, please report to the PSL Classroom. Wednesday, January 9th - Continue the philanthropy process by selecting the winners of this year's Magnified Giving grants. Friday, January 11th - Honors PSL students will be traveling to Wickliffe High School to participate in a poverty simulation facilitated by Lakeland Community College. The bus departs the PSL room at 7:50am and will return by 12:45pm. Traditional PSL students will begin our unit on The Power of Relationships by reading texts from Shel Silverstein and Mitch Albom. Homework: Traditional PSL students should read pages 1-68 of Tuesdays With Morrie, taking notes on that section in their PSL notebook in preparation for a quiz on Monday. Monday, December 17th - Review for this week's midterm exam. Participate in an activity on gratitude. Homework: Prepare for this week's midterm by ensuring your notebook is complete and thorough. Your notebook will be collected immediately after your midterm conference. Wednesday, December 19th - No classes due to midterm conferences. Friday, December 21st - No classes due to midterm conferences. Please make sure to submit your time sheet by noon today. Monday, December 10th - Celebrate the most successful Holiday Food Drive in PHS history...4,321 lbs. and counting! Reminders: PHS is on an adjusted bell schedule due to state testing this week. PSL students are expected to use the testing hours to fulfill their weekly volunteer requirements. Service hours are NOT reduced this week. Please be sure to communicate any schedule changes to your volunteer supervisor. Homework: If you have not done so already, please sign up for your midterm conference. Wednesday, December 12th - Review the meaning of "good" citizenship. Consider whether or not protests that swept the NFL during the 2017-18 season were characteristic of democratic citizenship. Use remaining class time to develop an answer to Midterm Question #4 in your PSL notebook. Friday, December 14th - Submit time sheet in x2vol. Review goals set in September, complete form articulating your personal and professional goals, and develop an answer to Midterm Question #5 in your PSL notebook. Homework: Study for midterm conference. Monday, December 3rd - Explore the differences between helping and serving by reading Rachel Naomi Remen's essay "In the Service of Life." Use any remaining class time to develop Midterm Question #2 in your PSL Notebook, and to ensure Midterm Question #1 and your Second Quarter journal reflection are complete. Wednesday, December 5th - What motivates you to serve? Consider this question and more as you read Adam Davis' article "What we don't talk about when we don't talk about service" in preparation for Midterm Question #3 . Homework: Answer Midterm Question #3 in your PSL notebook. Friday, December 7th - Turn in time sheets at the start of class. The Holiday Food Drive concludes today! All classes will be helping collect, sort, box, and deliver donations to the Perry Center. ​We are on an adjusted bell schedule next week due to End of Course testing. PSL student-led organizations (Power Packs, Recycling, etc) will follow a normal schedule. Monday, November 26th - Turn in last week's time sheets via x2VOL. Watch Arel Moodie's TED Talk on effort and capture key ideas in your PSL notebook. . Read/discuss exemplary reform proposals. Wednesday, November 28th - Review Holiday Food Drive details. Introduce Midterm Exam and explore the Chimamanda Adichie's TED Talk "The Danger of a Single Story." Friday, November 30th - Submit time sheets at the start of class using x2VOL. Review extra service opportunities. Pass out Holiday Food Drive materials. Participate in a small group reflection activity, and complete journal reflection on PSL experiences (following Second Quarter prompts) in your PSL Notebook. Monday, November 19th - Introduce holiday food drive goals and share volunteer options. Edit, revise, and submit collaborative education reform proposal. Students should submit their x2vol time sheet on November 20th. Although students are not required to volunteer over Thanksgiving break, they may choose to use these days to make up any missed hours assuming the organization they serve is open. Be sure to communicate your volunteer plans with your supervisor. Monday, November 12th - Share both education reform precis (as directed) at the start of class. Finish watching Waiting for Superman. Wednesday, November 14th - Highlight new Extra Volunteer Opportunities. Introduce the Collaborative Education Reform Proposal, and begin developing thesis/key arguments in class. Share exit slip (with proper paper set up, thesis, key arguments, and Works Cited) by the end of the block today. Friday, November 16th - Turn in time sheets at the start of class. Continue working on the Collaborative Education Reform Proposal in class. Monday, November 19th - Edit/revise the Collaborative Education Reform Proposal. Introduce Holiday Food Drive activities. Monday, November 5th – Continue engaging in the philanthropy process by choosing class finalists for our Magnified Giving grant. 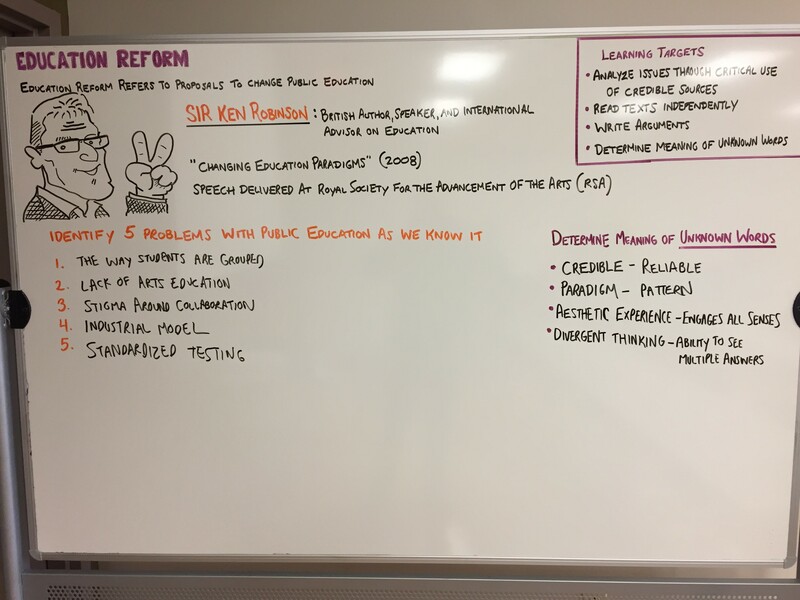 Wednesday, November 7th – Notes on Topics in Education Reform and Sir Ken Robinson’s TED Talk “Changing Education Paradigms.” Introduce reform topics, and explain precis assignment. Homework: Complete both precis assignments prior to the start of class on Monday, November 12th. Friday, November 9th – Turn in time sheets at the start of class. Begin watching Waiting for Superman, examining flaws in our current education system, and analyzing the results suggested in the film. Homework: Complete both precis assignments prior to class on Monday, November 12th. Monday, October 29th – Engage in conversations on philanthropy with local philanthropists Roger Grein (Magnified Giving) and Asa Cox (Asa's Angels). Wednesday, October 31st – Happy Halloween! PSL Honors students will conduct a LENS analysis on non-profits who are moving forward in our philanthropy process. Traditional PSL students will be reading "The Trouble With Philanthropy is That Money Can't Buy Equality" and reviewing MLA expectations. Students can access assignment directions HERE and an exemplar HERE. Service Opportunity: Looking to dress up for Halloween and earn extra service hours? Help out with the fire department's Perry Safe Halloween event in Manchester West. Check out extra service opportunities for more details. Friday, November 2nd- Turn in time sheets at the start of class. Participate in Conference Calls. 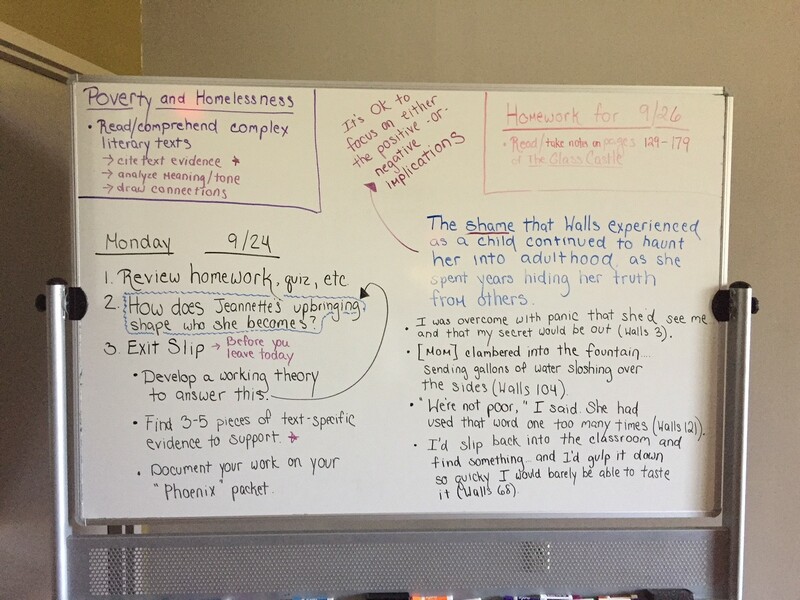 Interested in revising your The Glass Castle ​essay or one-pager analysis? Check out this link and handle any necessary revisions prior to October 31st. 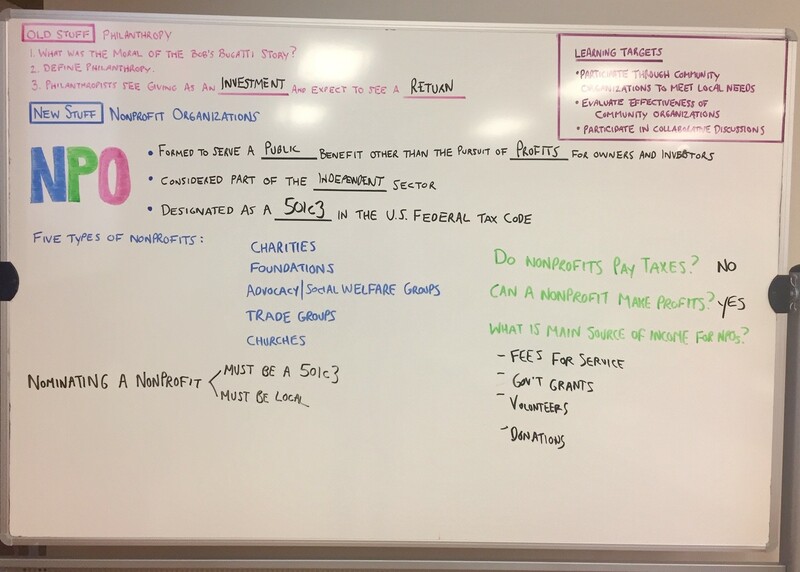 Monday, October 22nd – Review introduction to philanthropy notes. Take notes on non-profit organizations. Review nomination process and complete agency nomination form in class today. Homework: Be prepared to present the agency you nominated to small group on Wednesday. Wednesday, October 24th – Check out extra service opportunities. Using agency nomination forms, work in committees to select agencies that will continue on in the philanthropy process. Friday, October 26th - Turn in time sheets at the start of class today. Working in committees, complete a side-by-side analysis of the non-profits moving forward in our philanthropy process. NOTE: Students who had an excused absence today should complete the make up assignment by Friday, November 2nd. Monday, October 15th – Complete time sheet for week ending 10/12 using x2vol. Complete exam on poverty and homelessness. Wednesday, October 17th – Introduce Chicago urban plunge. 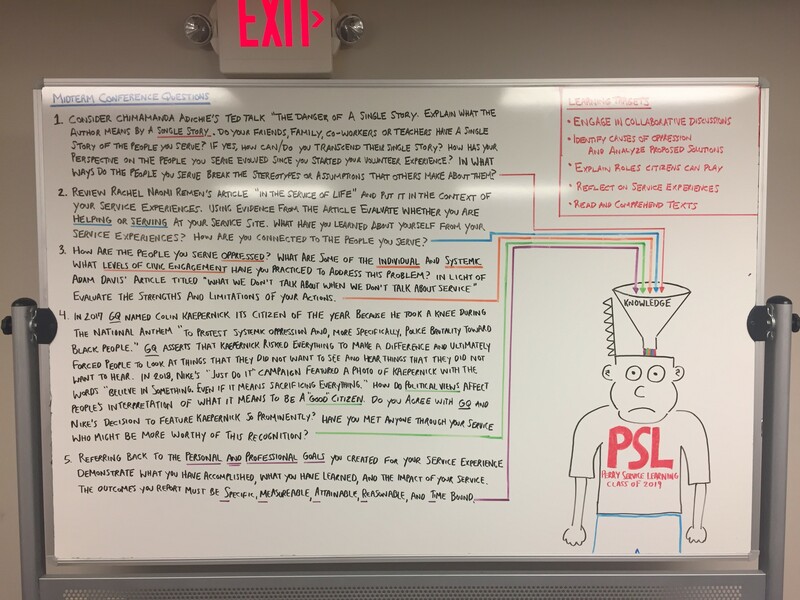 Complete reflection on your service experience in your PSL notebook. Meet in small groups to discuss service experiences thus far. Share 1st quarter notebook rubric and complete self-assessment. Turn in PSL notebook TODAY. Homework: PSL notebook and self-assessment rubric due at the end of the block TODAY. Sign up for Chicago urban plunge by Friday, October 19th. Friday, October 19th – Complete time sheet using x2vol. 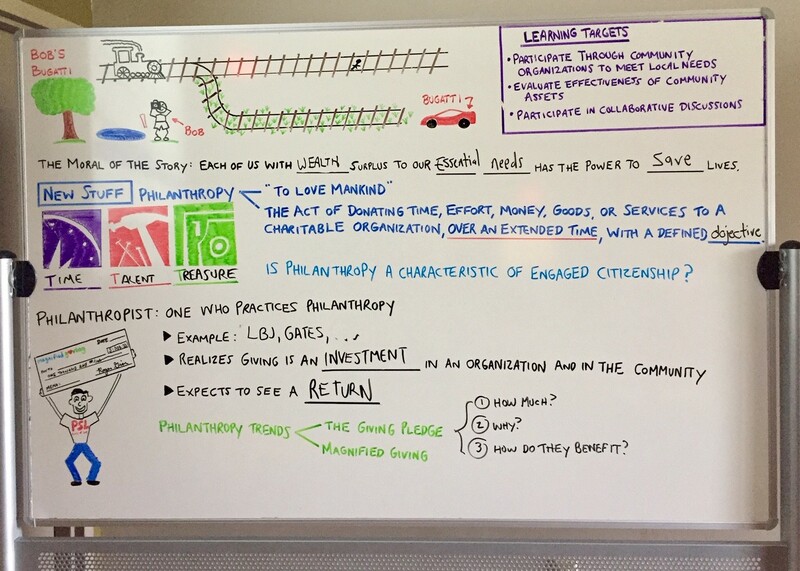 Introduce philanthropy unit with story of Bob's Bugatti and notes on philanthropists, The Giving Pledge, and Magnified Giving. In the class notes section of your notebook, identify five nonprofits that you have a personal connection with. Write the name of the nonprofit and why the organization is important to you. Monday, October 8th – Finish watching God Bless the Child, and take notes on welfare. Wednesday, October 10th – Participate in rotation station activity examining violence against the homeless. Review for Monday’s exam on Poverty and Homelessness. Homework: Literary analysis for The Glass Castle is due by 3pm on Thursday. Please share electronically with Mrs. Trentanelli (trentanellia@perry-lake.org) and bring hard copies of One Pager (if applicable) to class on Monday. 2. Volunteer in the PSL Kitchen from 3:00-4:00 p.m. on Wednesday, Oct. 10th. RSVP by emailing Mr. Soeder by Friday, Oct. 5th. 3. Volunteer with End 68 Hours of Hunger on Tuesday, Oct. 9th at 6 p.m. Click here for details. Monday, October 1st – Discuss vignettes from The Glass Castle. Review literary analysis assignment. Use class time to finish reading the book and/or begin drafting the literary analysis. Turn in exit slip before you leave for the day. Homework: Finish reading The Glass Castle, and begin drafting literary analysis. Wednesday, October 3rd – Participate in 1:1 conferences with Mr. Soeder, Mrs. Trentanelli, Mrs. Gigante, Mrs. Jonozzo, and Mrs. Healy. Use remaining class time to draft literary analysis. Homework: Prepare/share draft with Mrs. Trentanelli by the start of class on Friday. Review and revise Problem Solving Analysis Graphic Organizer using this answer key if you earned an IP or NM (corrections should be made on the back side of the original worksheet and must include ALL of the information from the answer key in order to earn credit). Friday, October 5th – Turn in time sheets via x2VOL. Share draft of literary analysis with Mrs. Trentanelli by the start of class today. Begin watching God Bless the Child. Homework: Using feedback from Mrs. Trentanelli, submit final draft of literary analysis by 3pm next Thursday. Monday, September 24th – Explore how Jeannette Walls' upbringing shapes who she becomes, and turn in notes/exit slip to classroom inbox. Continue reading/take notes on the text as time permits. Board notes and exit slip directions/exemplar available HERE. Homework: Read/take notes on pages 129-179 prior to class on Wednesday. Wednesday, September 26th - Participate in a conversation on poverty and homelessness with representatives from Extended Housing. Homework: Read/take notes on pages 180-230 of The Glass Castle by Friday. Friday, September 28th - Submit time sheets via x2VOL. Introduce the Power Pack collection drive. Watch interview featuring Jeannette Walls'. Introduce The Glass Castle literary analysis assignment. Continue reading The Glass Castle and collecting evidence that helps explain how the author's upbringing shapes who she becomes. Homework: Finish reading the text/taking notes by Wednesday, October 3rd. Bring draft of literary analysis to class on Wednesday, October 3rd. Monday, September 17th - Explore solutions to chronic homelessness. Continue reading The Glass Castle. 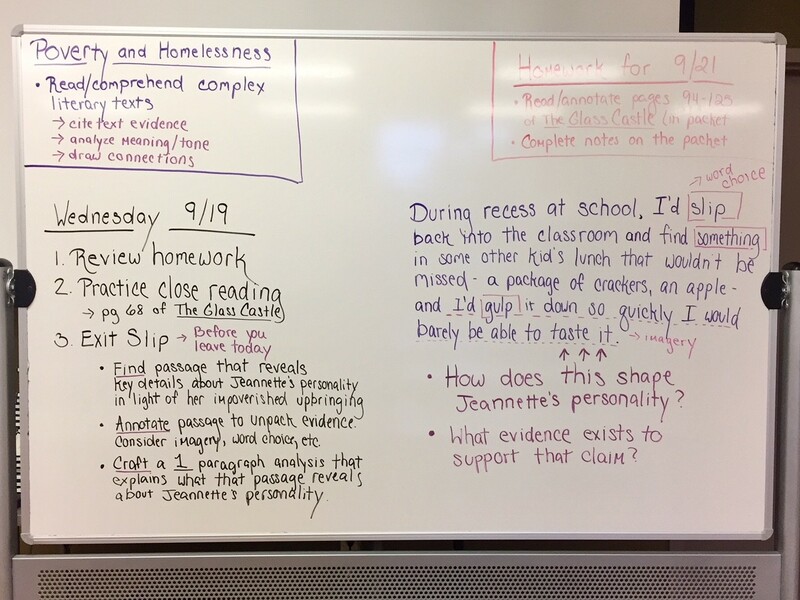 Wednesday, September 19th - Review pages 53-92 of The Glass Castle and begin analyzing specific passages. Homework: Read pages 94-125 of The Glass Castle (via handout) and complete reading notes (in packet) prior to class on Friday. Monday, Sept. 10th - Goal writing revision instructions. 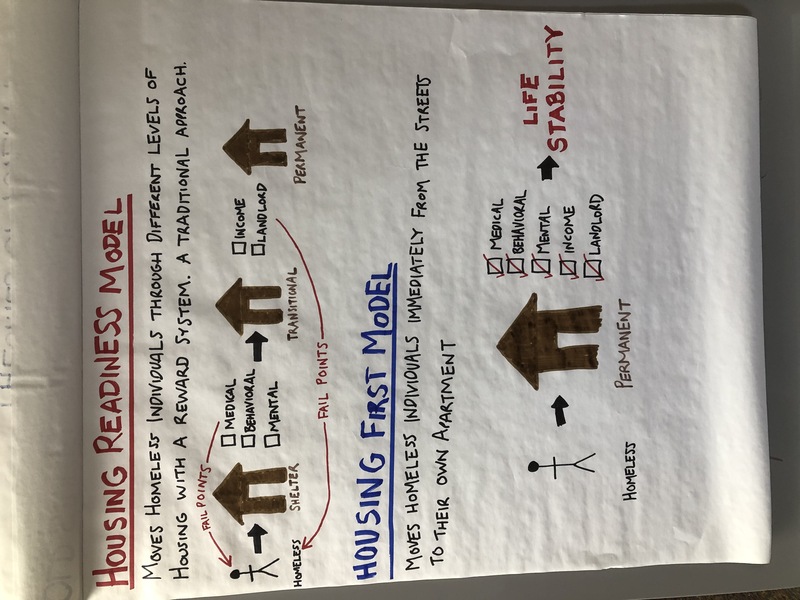 Begin unit on poverty and homelessness by participating in Shelter Seekers Activity and taking notes on levels of civic engagement. Homework: Complete goal writing revisions by Wednesday. Honors Homework: Complete reflection activity. Wednesday, Sept. 12th -Introduce The Glass Castle by reviewing the elements of a memoir, outlining reading notebook expectations, and read pages 3-25 in class. Homework: Sign out copy of The Glass Castle (if necessary) to finish for homework. Friday, September 14th - Submit time sheets for at the start of class today. Read pages 26--53 of The Glass Castle, and analyze Walls' childhood memories using these strategies. Take notes on the causes of poverty and homelessness. Monday, September 3rd - No school due to Labor Day. Tuesday, September 4th - Students who have turned in their EMA, Waiver of Liability, and have received email confirmation from their supervisor may begin volunteering today.. Note...in order to be excused from your required PSL hours, students who were missing their EMA and/or liability waiver must report to class. 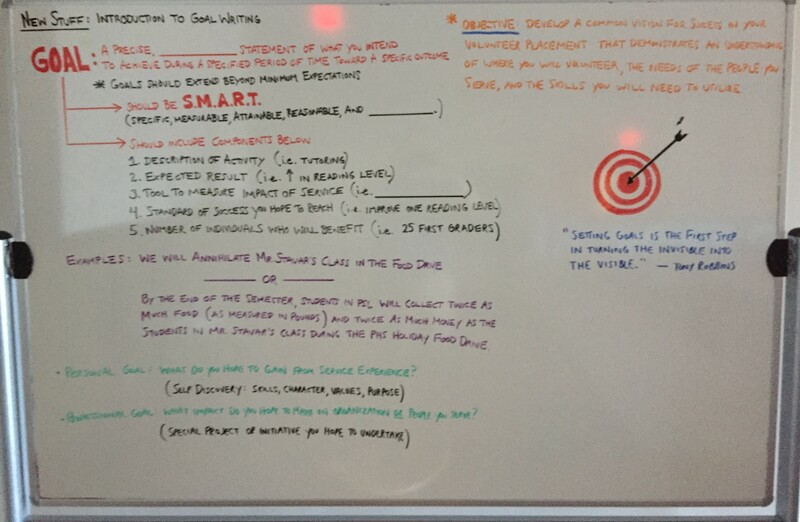 Wednesday, September 5th - Take notes on "Introduction to Goal Setting." Complete goal writing worksheet to practice writing S.M.A.R.T. goals. Review Service Learning 101 summative assessment, and revise personal and professional goals. Thursday, September 6th - Students who have turned in their EMA, Waiver of Liability, and have received email confirmation from their supervisor may begin volunteering today.. Note...in order to be excused from your required PSL hours, students who were missing their EMA and/or liability waiver must report to class. ​Friday, September 7th - Review Extra Volunteer Opportunities (Project SALES and Run for the Health of It), and enter Extra Volunteer Opportunities time sheets into x2VOL as appropriate. Review what to do when you are Short on Service hours. Submit this week's time sheets via x2VOL. Celebrate the conclusion of Service Learning 101 by watching/reflecting on George Saunders' commencement address. Honors: Meet with Mrs. Trentanelli to discuss Tuesdays With Morrie, watch a clip from Nightline, and begin crafting reflection assignment. Monday, August 27th - Review upcoming extra volunteer opportunities. Service learning pregame pep talk. Complete in class assignment on Empathy and professional dress. Honors PSL: Share "one pager" assignments and begin "exemplar" response project. Homework: Begin to prepare for service learning 101 summative assessment on Friday. Tuesday, August 28th - Students who have turned in their EMA, Waiver of Liability, and have received email confirmation from their supervisor may begin volunteering today.. Note...in order to be excused from your required PSL hours, students who were missing their EMA and/or liability waiver must report to class. Wednesday, August 29th - Review and respond to Dear Replacement letters and develop service goals. Honors: Participate in Mindful Moments. Homework: Prepare for service learning 101 summative assessment on Friday. Tuesday, August 30th - Students who have turned in their EMA, Waiver of Liability, and have received email confirmation from their supervisor may begin volunteering today.. Note...in order to be excused from your required PSL hours, students who were missing their EMA and/or liability waiver must report to class. Friday, August 31st - Create x2vol username and password and submit timesheet for week ending 8/31/18. Service learning 101 summative assessment. Monday, August 20th - Participate in volunteer fair during assigned class times. Tuesday, August 21st - Compose thank you notes to agencies who participated in the volunteer fair. Engage in small group discussions on on-campus volunteer options Share site selection form and complete for homework. Wednesday, August 22nd - Turn in site selection forms. Meet with high school guidance counselors. Participate in conversation on confidentiality. Thursday, August 23rd - Share volunteer matches with students. View and take notes on "Being Young and Making an Impact." Compose introductory email to your site supervisor. Homework (Honors): "One Pager" assignment is due on Monday. Friday, August 24th - No school due to staff professional development day. Tuesday, August 14th - Welcome to PSL! Review service responsibilities and expectations found in the PSL syllabus. View updated "PSL Students: Because of Them Someone Will be Better Off Today" video. Pass out course documents. Homework: Bring notebook to class on Thursday. Return all course documents and have parents complete Infinite Campus update by Friday. Wednesday, August 15th - Complete the Civic Disposition pre-assessment in class. Thursday, August 16th - Preview and prepare for volunteer speed matching on Monday. 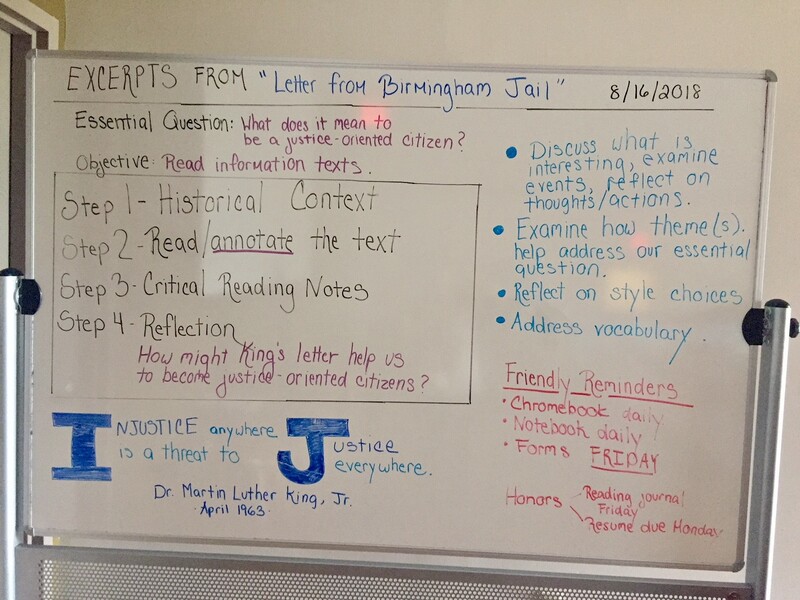 Examine the historical context from "Letter from Birmingham Jail," and read/annotate the excerpts. 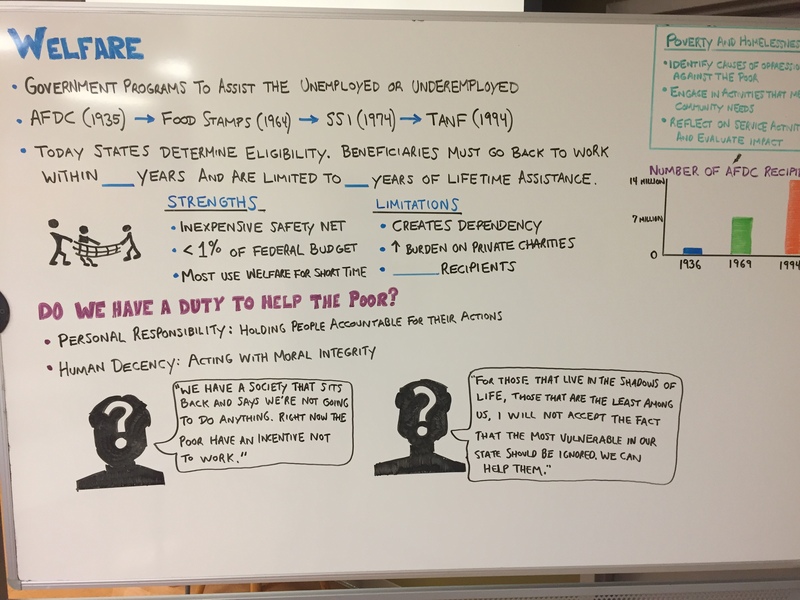 You can access board notes HERE. Homework (Honors Seminar): Complete/update resume and bring 7 copies to class on Monday to share during your interviews. Discuss what is interesting about the excerpt, examine the King's representation of the events, and/or reflect on his thoughts/actions. Consider examining how the theme(s) within the excerpt might help us define what it means to be a justice-oriented citizen. Reflect on any stylistic choices within the excerpts that are significant to the text. Review any challenging vocabulary words from the text, and define the word(s) as they are used in the context of the passage. Friday, August 17th - Collect course documents. Review "Letter from Birmingham Jail" assignment. Take notes on interview strategies and resume writing techniques in preparation for Monday's volunteer speed matching. Homework: Bring 7 copies of your resume to class on Monday to share during your interviews. Honors PSL Students: We will be meeting during your assigned class time on Friday, August 17th to share your summer reading journals and begin developing your "one pager" analysis.